2.5 billion. That's approximately the number of times the human heart beats in 70 years. And sometimes during the course of its unrelenting contractions and relaxations, the heart muscle can no longer bear the strain. If heart muscle cells–cardiomyocytes–could be repaired by cells taken from one's own body, the patient's recovery improves. But manufacturing heart cells requires an exacting process tailored specifically to an individual. Laid out in a new article published today in Advanced Functional Materials, a team of researchers at Michigan Technological University in collaboration with Harvard Medical School, shows how cardiomyocytes grown in a heart-like environment mature more quickly, have improved functionality and are less likely to be rejected by patients' bodies. Many people with heart injuries from heart attacks or birth defects could benefit from the "self-therapeutic" process of injecting healthy cells into the damaged heart muscle. Labs use induced pluripotent stem cells, also known as master cells, which using biochemical cues can be "programmed" to become any type of cell, whether for the heart muscle or otherwise. Yet current processes result in underdeveloped cells. To date, manufacturing cardiomyocytes has occurred in two-dimensional settings (essentially, petri dishes). But the growth environment plays a large role in the ways the cells develop. 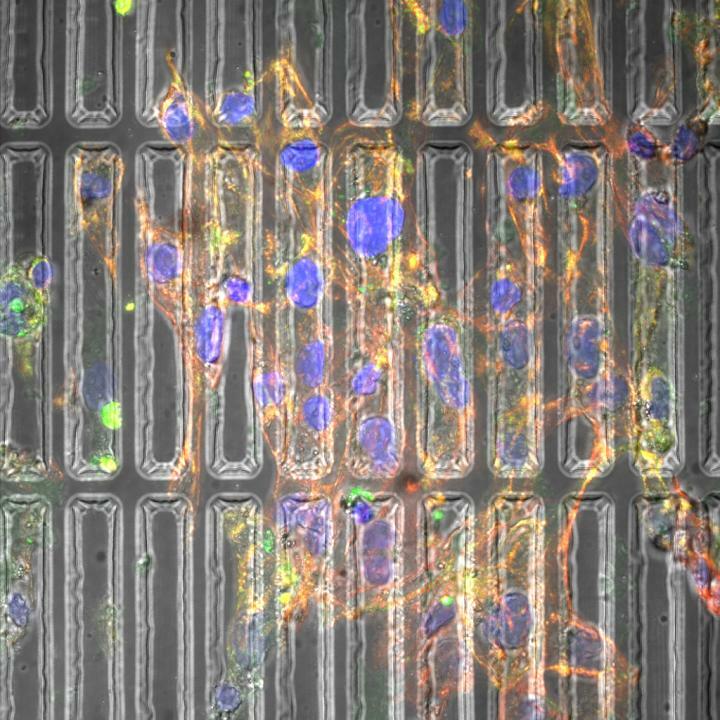 Thus, simulating the actual heart environment–with lots of pressure and specific forces acting on the growing cells–could lead to more robust cardiomyocytes. "Unfortunately stem cell therapeutics don't have high success rates partly because the cells are not mature and fully functional. The maturation and functionality are essential," says Parisa Pour Shahid Saeed Abadi, assistant professor of mechanical engineering, whose work in creating heart cell growth environments is detailed in the new article "Engineering Mature Human Induced Pluripotent Stem Cell-Derived Cardiomyocytes using Substrates with Multi-Scale Topography." Abadi and her coauthors have created three-dimensional substrates–essentially, molds–that recreate the environment in which heart cells grow inside the human body. Biomechanical properties the substrates induce include pressure and stiffness. "The mechanical properties of substrates play an important role in the cell behavior because the mechanical cues that cells sense in the actual (heart) environment is unique," Abadi says. "We are using biochemical and biomechanical cues to enhance the differentiation and maturation. If we don't take advantage of the physical cues and only rely on chemical cues, the process suffers from low efficiency and batch-to-batch inconsistency." Using photolithography and re-flow processing, Abadi's substrates are patterned at the micron and submicron levels, approximating the natural physical forces cells experience. Photolithography uses ultra-violet light to remove portions of polydimethylsiloxane (PDMS) substrate to mold it into cylindrical shapes. Additional micro-patterning of the substrate changes the cytoskeleton in the cell and the shape of the nucleus, which cause the genes in the cell to change. As the cardiomyocytes mature, they beat stronger and resemble the cells found in natural, mature heart muscle. "On day one we start seeing the effect of the substrate on the morphology of the cells," Abadi says. Abadi's lab, which is partly funded by the American Heart Association, continues to improve the substrate preparation methods. As cardiomyocytes need to communicate with each other during their growth, Abadi also plans to stimulate electrical conductivity between cells. Translational studies in animals are the next step for the research. "My lab works at the interface of materials, mechanics and medicine," says Abadi, who came to Michigan Tech in 2017 following a National Institutes of Health post-doctoral fellowship at Harvard Medical School's Brigham and Women's Hospital. Abadi notes that her lab relies on the interdisciplinary backgrounds of its undergraduates, graduate students and post-doctoral researchers, combining different knowledge bases to solve complex questions of fabricating better nanomaterials for medical applications that cannot be tackled from one discipline alone. "I pick problems I can solve with the knowledge of mechanical engineering and nanomaterials," she says. "I use microfabrication and nanofabrication techniques to tackle problems that are challenging for biologists or clinicians to address." To mend broken hearts, Abadi and her engineering team have learned that strong cardiomyocytes grow better under pressure.